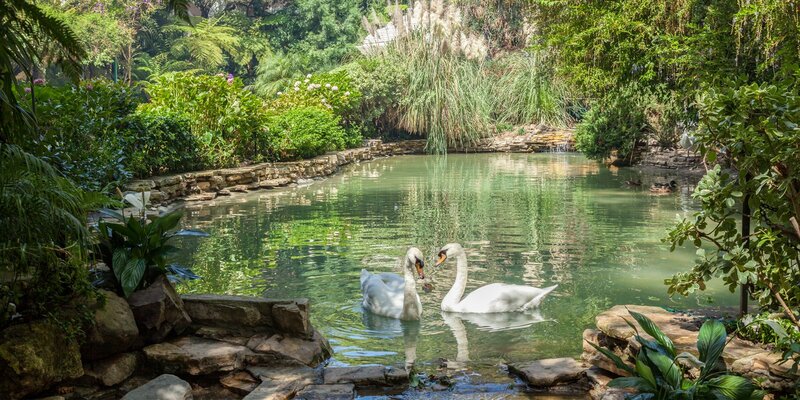 From graceful swans and hovering humming birds, to towering trees and runaway bougainvillea, Hotel Bel-Air is surrounded by lush gardens basking in the sunshine. A true oasis nestled in 12 glorious acres, which seem a whole world away from the city’s bright lights. Let us take you on a tour. Undoubtedly one of the most romantic areas of our grounds is the front lawn. It’s been the idyllic setting for numerous weddings and a spectacular backdrop for many memorable photos. As you stroll across Swan Lake towards the lawn, take a moment to look up at the shady canopy of soaring trees and listen out for the running steam. Look closely for the Canadian maple tree and if you’re lucky you’ll be able to smell its distinctive syrup. 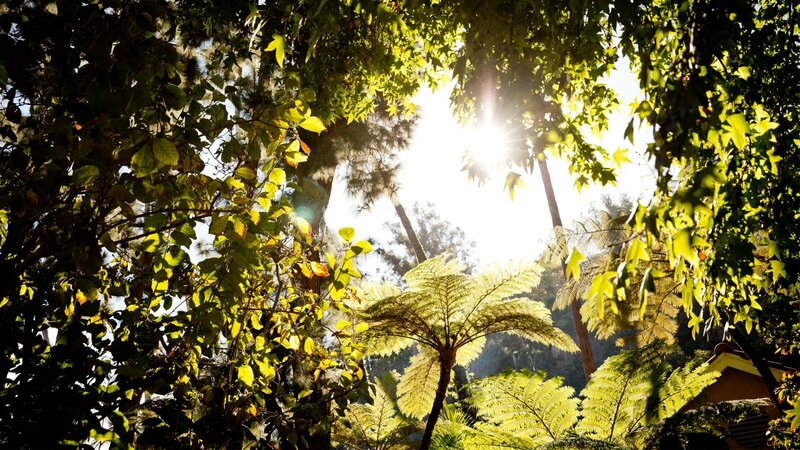 Many of the trees and flowers found at Hotel Bel-Air are rarely seen in Southern California, such as our grove of coastal redwoods, white flowering bird of paradise, and the tipu tree with its delicate yellow blossom towering over Chalon Road. As you wander, see how many fruit trees you can identify. We have everything from pineapple and guava to orange, lemon and apricot trees – we’re never short of fresh fruit! High up in the hillside, our elegant Premier Canyon Suites are the best place to appreciate LA’s enchanting blend of indoor-outdoor lifestyle. You’ll be perfectly placed to spot a sprawling herb garden, fig trees and fragrant orange blossom embracing the iconic pink stucco walls. The majestic bell tower is wrapped in the bright red petals of trumpet vine, while ferns frame brick walkways and large stone pots fill courtyard patios with the sweet fragrance of perennial blooms. When taking a dip in the pool you’ll notice the incredible dappled light, kindly provided by an array of majestic Kings Palms for that signature LA look. If you visit during summertime you’ll find a wealth of pretty impatiens adding a splash of colour. 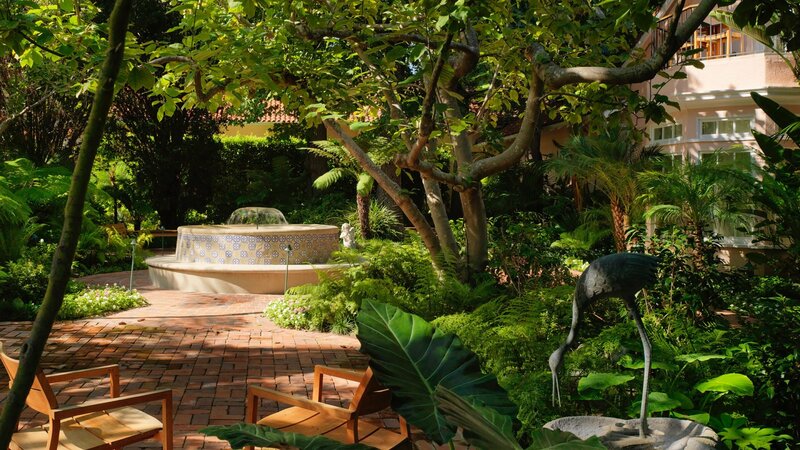 For a fragrant blast of exotic jasmine, take the winding path to our most northern courtyard. Tucked away in this courtyard, you’ll find rows of boxwood hedges lined with wonderful mix of cyclamens, hydrangeas and gardenias. 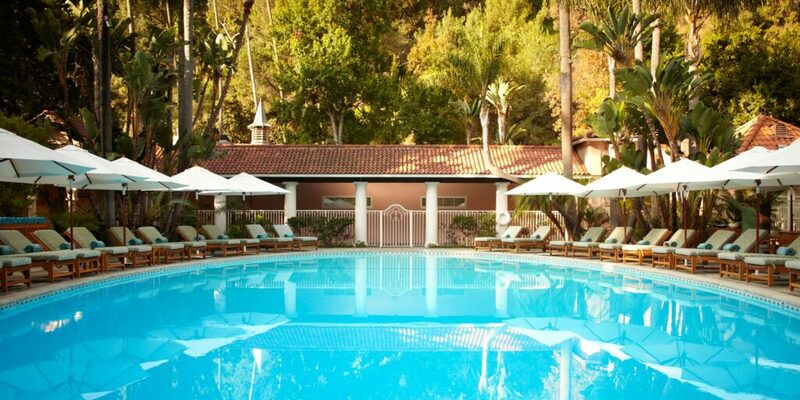 Whether retreating to your guestroom, venturing to the pool or making your way to the spa, the tropical grounds of Hotel Bel-Air provide a magical, secluded atmosphere to relax, indulge, and truly get away from it all. We invite you to come and experience all this for yourself. We know just the person to recommend wonderful ways to discover the lesser-known gems on the outskirts of the Eternal City. Meet Luca Virgilio, general manager for Hotel Eden in Rome. Rome has been affectionately referred to as ‘Hollywood on the Tiber’, thanks to its impressive cinematic history dating back to the 1930s. It’s the home of Cinecittà, Europe’s largest film studio, and the city hosts a prestigious annual film festival now in its 13th year, keeping the city firmly on the cinematic map. Let’s take a look back at some of the city’s film highlights. Gray Malin, fine art photographer and New York Times bestselling author, has created a series of captivating images to celebrate The Beverly Hills Hotel’s wonderful heritage. In his own words, hear how he combined our timeless Hollywood glamour with his own signature style. We’re delighted to be partnering with Mapstr, an innovative smartphone app which allows users to create personalised maps and save favourite locations around the world. Let us take you behind the scenes of our glorious Presidential Suite at Hotel Bel-Air, the preferred choice of many celebrities. 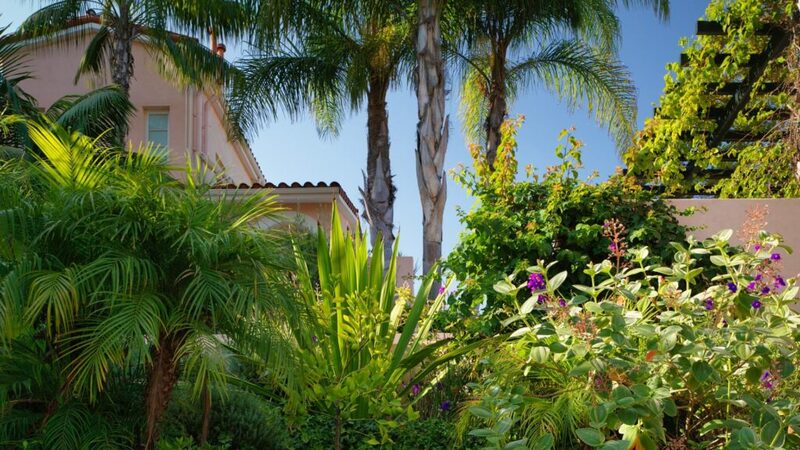 Offering the epitome of California’s famous indoor and outdoor living, it has a few surprises to delight its guest – let us show you.